﻿ WebDesign Chess 1.0 eng - WebDesign Kft. 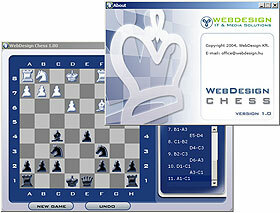 WebDesign Chess 1.0 is a free chess program for Microsoft Windows. You may play against the computer in different levels of difficulty. You may change your side, or step back if needed. To play, just drag the figure you want to step with, and put to the desired square. The machine will instantly start to compute his step. 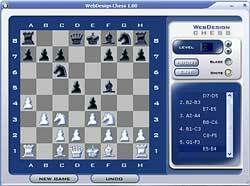 This is an install version of WebDesign Chess 1.0, after downloading please run the program to install the Chess software.